We like an online slot with a narrative and here we have the Bigbot Crew, a gang of ‘tech-heads’ who like to build futuristic robots whose purpose seems to be to help players win a bit cash; it’s developed by Quickspin and you can find out how it all works right here. Bigbot Crew may sound like a rap group from the 1980s but in fact it’s a five reel slot with four rows and forty fixed paylines; those reels spin on a pavement in front of a slightly shabby street scene in an unnamed country. The higher value symbols include our three techies – Matsuo, Danielle and Joaquin – along with two drone-like creations; four cogs in various colours represent the lower values. The Bigbot robot is wild, he appears on reels two, three and four in the base game and he will replace all others to help form winning combos except for the scatter symbol; he’s four positions tall and can be nudged so that he covers all positions on a particular reel. This is triggered by landing at least two of the Bigbot wild symbols completely covering all positions on two reels; you’ll now receive respins equal to the number of Bigbots on the screen. Any new Bigbots landing will add an extra respin and all wilds will appear in new positions on each spin. Trigger this by landing at least three of the blue scatter symbols anywhere in view and you’ll receive an initial eight free spins; Bigbots appear on all reels during this round and any which land covering all positions will award an extra spin. Bigbots landing partially in view will nudge to cover all positions but won’t award a spin. 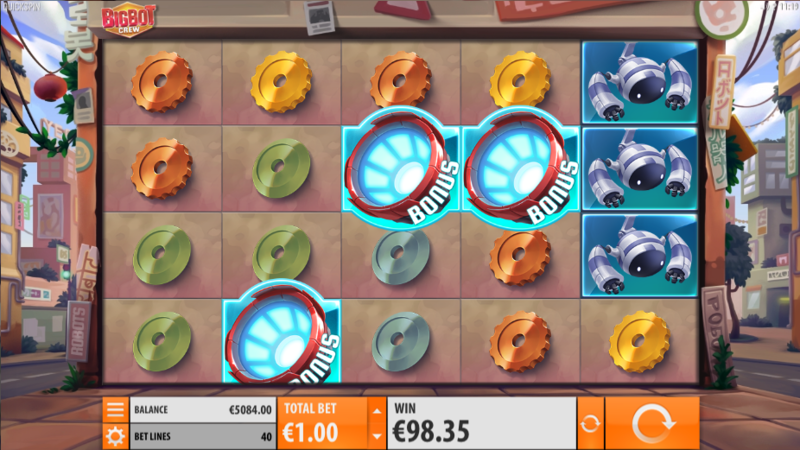 Bigbot Crew is a very high quality slot from the always-dependable Quickspin; the bonus features are inventive and seem to trigger regularly and there’s a story of sorts which holds the game together. It comes with an RTP of 96.51%.